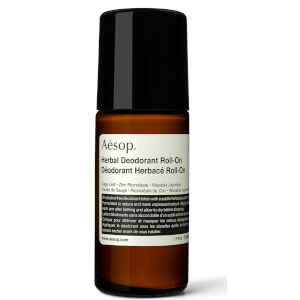 Stay fresh around the clock with Aesop Deodorant Roll-On; an alcohol-free formula that delivers long-lasting protection against wetness, body odours and perspiration. Infused with a host of beneficial ingredients, including Vetiver Root, Zinc Ricinoleate and Wasabi Extract, the roll-on deodorant works to protect your underarms for all day freshness. 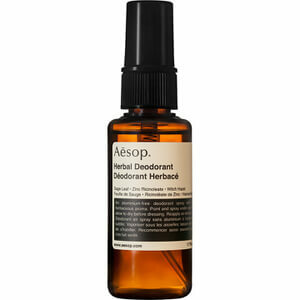 Imparts a woody, earthy and herbaceous aroma. Water (Aqua), Coco-Caprylate, Glycerin, Ceteareth-20, Zinc Ricinoleate, Cetearyl Alcohol, Sorbitan Stearate, Candelilla/Jojoba/Rice Bran Polyglyceryl-3 Esters, Glyceryl Stearate, Bisabolol, Phenoxyethanol, Polysorbate 20, Benzyl Alcohol, Microcrystalline Cellulose, Sodium Stearoyl Lactylate, Pelargonium Graveolens Extract, Lavandula Angustifolia (Lavender) Oil, Fusanus Spicatus Wood Oil, Sodium Gluconate, Xanthan Gum, Pogostemon Cablin Oil, Eucalyptus Globulus Leaf Oil, Ethylhexylglycerin, Wasabia Japonica Root Powder, Eugenia Caryophyllus (Clove) Flower Oil, Melaleuca Alternifolia (Tea Tree) Leaf Oil, Cellulose Gum, Vetiveria Zizanoides Root Oil, Coriandrum Sativum (Coriander) Seed Oil, Cymbopogon Schoenanthus Oil, Sodium Benzoate, Zingiber Officinale (Ginger) Root Extract, Lactic Acid, Potassium Sorbate, Tocopherol, Linalool, Citronellol, Geraniol, Eugenol, Farnesol, Citral, d-Limonene.